LISTENING IS THE NEW READING Welcome to Audible, an Amazon company. Home of the world’s largest selection of audiobooks, audio shows, and original series. Hear A-list celebrities narrate their favorite stories, enjoy full-cast performances, discover Grammy® award-winning audiobooks, and more. Listen to your audiobooks anytime, anywhere—at home or on the go with our free app. Even if you switch devices, you'll never lose your place. 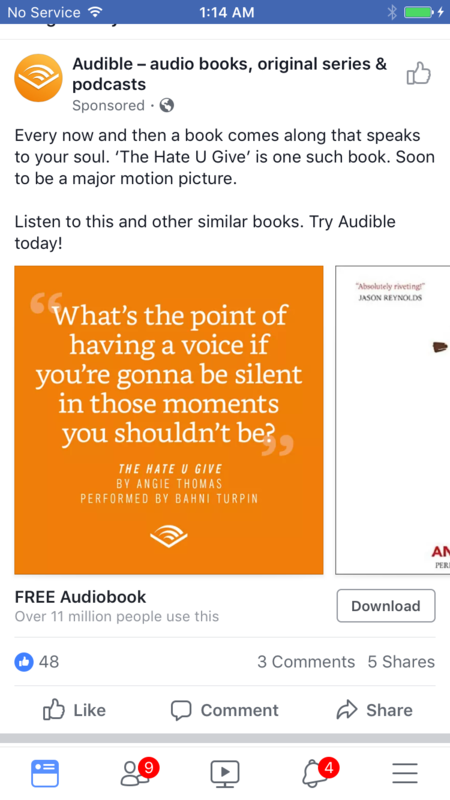 Download the Audible app free today. WHAT’S TO LOVE - Explore new releases, best-sellers, mysteries, sci-fi, romance, and memoirs – whatever your passion you're sure to find the perfect listen. - Keep up to date on current trends, news, and events with Audible original audio shows and top stories from The New York Times, The Washington Post, and others. - Whether you’re relaxing at home, commuting to work, at the gym, or just doing chores, there’s a story for every activity. WHAT WE’RE LISTENING TO - The 5 Second Rule by Mel Robbins - IT by Stephen King - The Subtle Art of Not Giving a F*ck by Mark Manson - I Can’t Make This Up by Kevin Hart - Artemis by Andy Weir EXPLORE FEATURES FOR THE AUDIOBOOK LISTENER - Download your books to listen to offline. - Automatically sync your audiobooks across all your devices. - Customize your narration speed. - Set a sleep timer for up to an hour, or until the next chapter. - Seamlessly switch between listening to audiobooks and reading ebooks on your Amazon Kindle with Whispersync for Voice AUDIBLE APP FOR APPLE WATCH Now you can leave your phone at home and take your Audible books with you on Apple Watch. Sync your Audible titles from your iPhone and play them from your Apple Watch via Bluetooth. Rewind, pause or set a sleep timer from your watch. Experience the freedom of hands-free listening: stay active while listening to best selling audio books or hit the road, sit back and enjoy while commuting. Available on Apple Watch Series 1 or higher. HERE’S HOW TO GET STARTED 1. Download the free Audible app 2. Sign in securely with your Amazon account 3. Choose any book to start listening. Your first book is free WHAT OUR LISTENERS ARE SAYING “I have felt every range of emotion while listening, getting so caught up that I’m actually ‘happy’ to hit traffic” – James C. Listener since 2010 “My son wouldn’t read. But he listened to book after book and loved them so much, he learned to read!” – Noelle C. Listener since 2006 “I find that audiobooks bring a story to life, and add a dimension to the characters that reading doesn’t always give me.” – Laura H. Listener since 2001 “After my daughter was born, I simply didn’t have time to curl up with a good book anymore. Audible gave that back to me.” Jay O. Listener since 2011 Download the free Audible audiobook player and start listening!